Put the marinade ingredients in a bowl and mix together well. Get your prawns and pat them dry to get rid of any excess moisture; then add them to the marinade, ensuring they are fully-coated. Leave to marinate for a minimum of 10 minutes, or up to 2 hours for best results. To make the sauce, steam the eggs in a wok with a steamer stand for 10 minutes, then leave to cool. Once cool, peel off the shells and separate the whites from the yolks. Set aside the whites for use in another recipe - maybe as a replacement for light soy sauce in this Garlic and Egg Fried Rice recipe! Now, crumble the yolks into a small bowl and, using the underside of a spoon, blend them into a paste. Mix this together with the rest of the sauce ingredients until smooth and free of lumps. Finely chop the chilli, if using, and set aside. Add the cornflour to the marinated prawns and mix together with your hands until the prawns are dry and dusty-white in colour (Hint: you will know that you’ve got enough cornflour around your prawns if, when you pick up a prawn and push your thumb into it, the cornflour does not slip off). Time to build your wok clock! On a clean plate, put your prawns at 12 o’clock, then arrange the curry leaves, chilli and sauce bowl clockwise around your plate. Carefully add the prawns and deep-fry until golden brown, about 3 minutes. Remove the prawns carefully with a slotted spoon and drain well on a plate covered with kitchen paper. Repeat this process once more if you want a deeper golden-brown and even more crisp! 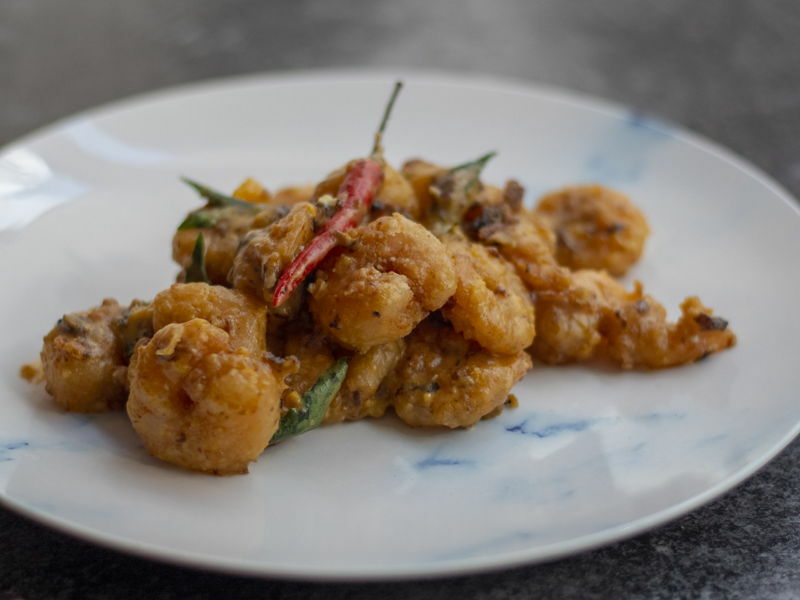 In a separate wok, heat ½ tablespoon of vegetable oil over a low heat, add the curry leaves and chilli, if using, and stir-fry for 30 seconds or so until fragrant. Pour over the sauce and continue to cook, stirring, for a further minute or so until the sauce has thickened slightly and is just starting to boil. Add the prawns to the wok and toss through two to three times to mix everything together. Serve immediately.